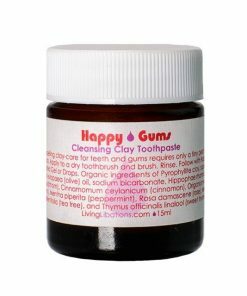 Compelling clay-care for teeth and gums requires only a tiny amount on a toothbrush. Apply to a dry toothbrush and brush for a deep clean. Rinse. 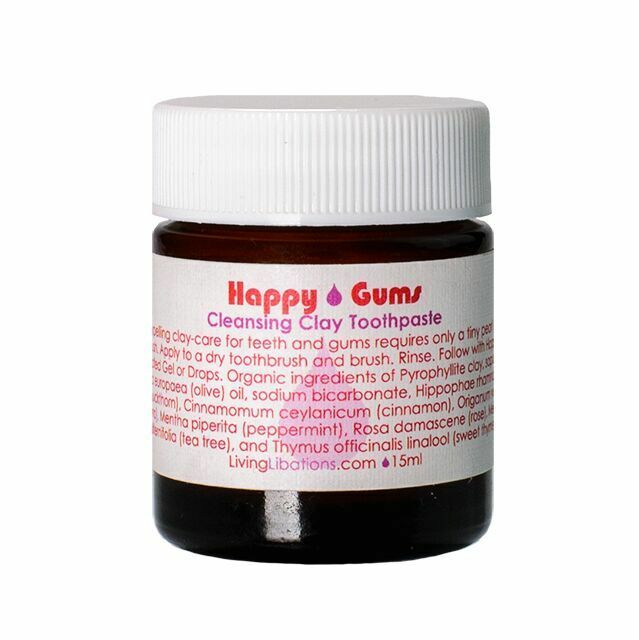 Follow with Happy Gums Ozonated Gel or Drops and the rest of the Successful Oral Care steps. Virgin Coconut (Cocos nucifera) Oil – This diverse lip is a caring carrier oil and botanicalbiotic coconspirator that balances oral ecology. This optimal oil soothes the oral tissue and gently removes bacteria that cause bad breath. Sodium Bicarbonate (baking soda) – Teeth thrive when they are bathed in a sea of sweet saliva, and baking soda buffers and neutralizes food acids. In addition to being an effective cleaning polish, baking soda is gentle. It has significantly lower abrasiveness than the cleaning agents of chalk and silica that are used in commercial toothpastes, and the baking soda’s natural alkalinity neutralizes bacterial acidity. Seabuckthorn (Hippophae rhamnoides) Essential Oil – Seabuckthorn is a serious soother to all oral sensitivities and plaque proclivities! This rich, vital, supercritical extract is packed with perfect levels of essential fatty acids including omegas 3, 6, 7, and 9. It infuses the mouth with beneficial vitamins, provitamins, phytosterols, carotenoids, and ultra-rare palmitoleic acids. Rose Otto (Rosa damascene) Essential Oil – Rose is a precious and elegant essence. It takes sixty roses to make one drop of rose otto essential oil! It is one of the most valued oils for its tonifying effects. Clove Bud (Eugenia carophyllata) Essential Oil – Distilled from the flowering buds of the clove tree, this cogent culinary plant is robust breath freshener and king of oral care. Clove oil has freshened breath and been an optimal choice for oral care since ancient times. Its botanical constituents of eugenol, esters, and sesquiterpenes, combine to create a powerhouse for a clean, fresh mouth. I went to the dentist last summer, and found I had a cavity in my teeth, with a couple others about to form. 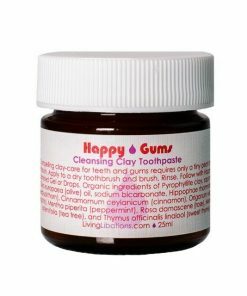 I started using this clay toothpaste (and i am not even that good at flossing or brushing consistently). I went to the dentist this summer and there were no cavities, very little buildup on my teeth, and my gums are great! The dentist couldn’t believe I stopped using their fluoride toothpaste. Natural is best, and this stuff is my favorite! NINJA TURTLES FOR YOUR TEETH! 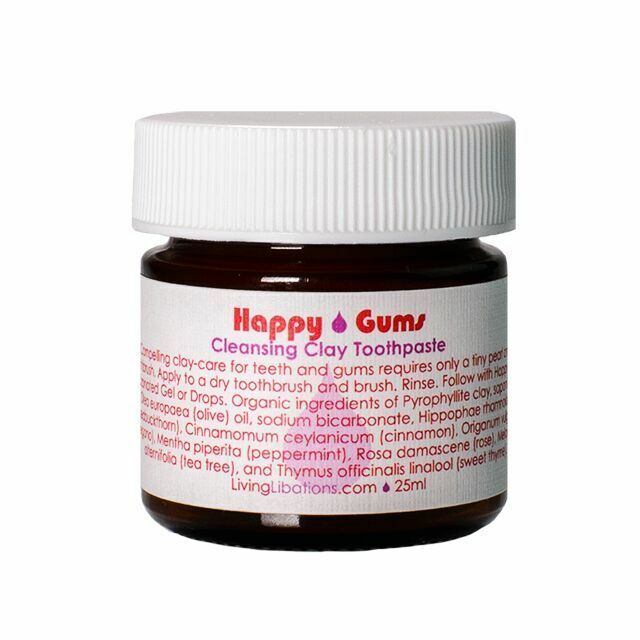 I am using for two years now the “Happy Gums Clay Toothpaste” and the “Happy Review Happy Gums – Living Libations Gum Drops” and I AM literally SAVED!!!! Those two are my HOLY GRAIL products and I will never stay without. All my adult life I was suffering from bad breath, root canals, bleeding gums and many other oral issues. I have spent a FORTUNE on dentists and that nightmare never ended. All my problems have stopped the day that I read the amazing book of Nadine Artemis “Holistic dental care, the complete guide to healthy gum and drops” and I have started using her amazing products. I am using the clay toothpaste every night and I am following my routine with 1-2 drops of the gum drops in some water and use that as a mouth rinse. When I have bleeding or painful gums I apply a drop of the gum drops on some floss and I always apply a drop on my tongue and then remove it with my tongue scraper. Some mornings (especially on Sundays when I have time) I practice oil pulling with some coconut oil, but I will definitely purchase the new Living Libations product “happy gum drops+ oil swishing serum” that I believe will be a magical one. And now you ask….ok….but what’ up with the title of this review “Ninja Turtles” for your teeth??? J))…Well….while having this conversation with my sister and while I was explaining how amazing, protective for your teeth these products are, how strong they fight the tooth decay and the buildup, how much they protect your oral health and that she should immediately place an order, my nephew who was watching “Ninja Turtles” on youtube but was also hearing the conversation said ”Wow mam….this stuff that Eva talks about sounds like Ninja Turtles for our teeth!!!!!”…..:))))))))…..Yep…….correct!!!!! Enjoy!!!! HELPED SOLVE MY RECEDING GUMS, I WILL NEVER BE WITHOUT IT! I will never be without this product. I absolutely love it! The first time I used it, about 4 years ago, the taste took some serious getting used to after using awful drugstore toothpaste all my life, but after only a short while I was hooked! I love the super ‘dentist clean’ feeling of my teeth after every time I brush. It’s also helped cure my receding gums which is amazing. I buy several jars at a time to make sure I never run out! I must admit, the taste of this was not my favorite. I have used similar natural toothpastes before, but this one was quite pungent in comparison. However, the ingredients are wonderful and the toothpaste is effective! I can see myself liking this very much with time, but it would take a bit of getting used to. I caution everyone to use only a small amount of this toothpaste each time – less than with normal toothpaste. I definitely used too much at first without reading the full product description! It is more pleasant with less, and the job still gets done. Its a lovely, unusual toothpaste, but it does a great job!